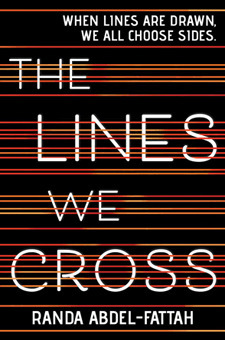 In February, I listened to a teen/YA audiobook that I'd been hearing great reviews of: The Lines We Cross by Randa Abdel-Fattah. This very relevant story of two teens on opposite sides of the immigration issue was engrossing and eye-opening. Michael lives a typical teenage life, going to school and hanging out with his friends, playing video games and basketball. On weekends, though, Michael's parents bring he and his brother along to anti-immigration rallies. His dad has started an organization called Aussie Values, and both of his parents feel strongly about "protecting their democracy." Michael isn't as passionate about the cause as they are, but a lot of what they say makes sense, and he knows his parents are both good, caring people. More pressing in Michael's mind is that his dad plans for him to follow in his footsteps, become an architect, and join his business, but Michael wants to be a graphic designer. How can he tell his dad and bust his dreams? On the other side of the latest rally, Michael spots a beautiful girl with long, dark hair who immediately captures his attention. At school on Monday, he discovers that her name is Mina, and she is a new scholarship student at his exclusive private school. And Mina is a refugee from Afghanistan, her family representing exactly the kind of immigrants that Michael's parents rail against. Mina has her own problems, trying to fit in at this new school, helping in her step-father's restaurant, and helping her parents face increasing venom - and violence - against them in their new neighborhood. Even as Mina and Michael begin to get to know each other, Michael can't even begin to imagine what Mina has been through in the past. How can Michael balance what his parents believe against what he is learning from Mina and his own research? And where does he stand? I was surprised to learn that Australia is struggling with the same kinds of divisive issues that we are seeing here in the U.S. This story is made all the more interesting because both sides of the issue are presented as three-dimensional and with good intentions. The reader sees the immigration issues from the perspective of both Michael's family and Mina's and feels the struggle within Michael between what he is experiencing and what the rhetoric says. With fully-formed characters and an intriguing plotline, this compelling and thought-provoking novel feels very current and real, even more so on the audio, read by two different narrators. You can listen to a sample of the audio at this link. Or order The Lines We Cross from Book Depository, with free shipping worldwide. I liked this book, too and agree that it's interesting to see an issue we area dealing with in the US played out somewhere else. I don't know why that surprised me but it did! Guess these are global issues & divisions, unfortunately. Have you read Exit West yet? Another great & unique look into immigration.